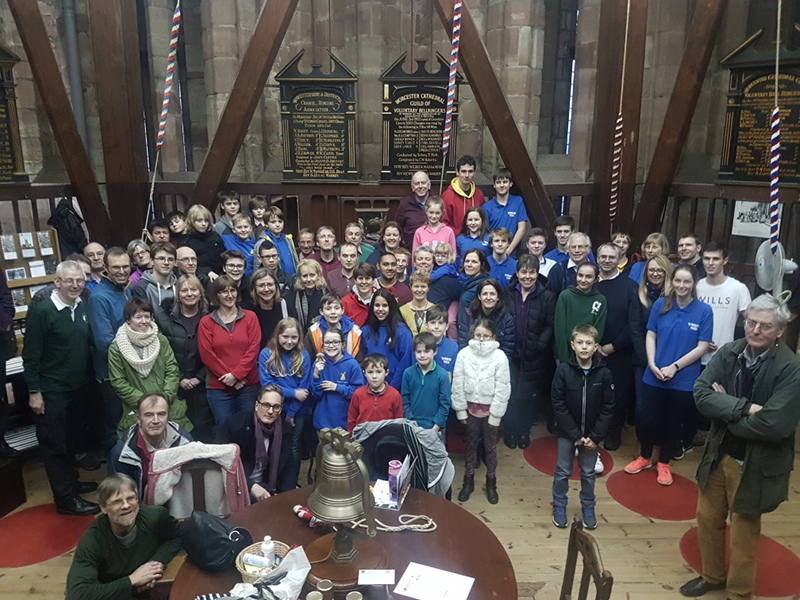 The weekend of 3rd/4th February 2018 saw 12 Yorkshire Tykes and their parents ringing in the City of Worcester. Invited by Mark Regan and the Worcester ringers we were joined by more young ringers from Birmingham and Worcester area. In the morning we rang at Old Saint Martins (10 bells), St Swithun (6 bells) and All Saints (12 bells). All within easy walking distance of each other in the city centre. Then after a short lunch break it was on to the Cathedral for a guided tour of the building, a visit to the Teaching Centre, a tour of the bells, and finally ringing on the fantastic 12 bells in the tower. All our young people rang some rounds and call changes, and the more advanced rang the back bells. In the evening we enjoyed a social event with games and pizzas in the Chapter House before returning to the Premier Inn for drinks and an entertaining game of cards. Sunday morning saw us back at the Cathedral to ring for morning service. Again everyone was invited to ring, methods included Call Changes, Little Bob Maximus and for some of our ringers Cambridge S Maximus and Bristol S Maximus. We finished with a visit to a coffe shop with the local ringers before heading home. Thanks to the Worcester ringers for their warm welcome and for organising such a great weekend.